Even as major development finance institutions were committing to funding the development of Nigeria’s special economic zones in Abuja, work had commenced on Enyimba Economic City in Abia State. “We agreed to be part of the project because it has been long overdue. We have no doubt that it will succeed,” said Mr Kayode Pitan, managing director of the Bank of Industry. For Abia State Governor, Okezie Ikpeazu, and the communities that donated land, it was hope kept alive as the management of Nigeria SEZ Investment Company Limited (NZESCO) and the chief executive officers of Afreximbank, Bank of Industry and Nigeria Sovereign Investment Authority (NSIA) signed the dotted lines at an event presided over by President Muhammadu Buhari in the Council Chambers of Aso Rock. The three development finance institutions are among the five to partner with NSEZCO and the Ministry of Finance Incorporated. NSEZCO intends to raise at least US$500million in equity over the first five years to develop special economic zones in the country. The other investment partners are the African Development Bank (AfDB) and Africa Finance Corporation (AFC). At that same venue a few months back, the President had presided over the signing of an agreement for the development of Enyimba Economic City and the governor had returned home a happy man enthusing in an interview with a newspaper that,” Most of our people don’t bequeath legacies that are futuristic. I am from the South-east and I am pushing for the Enyimba Economic City. “This project will blossom and create 200,000 jobs because of the sheer enormity of the positive effects on my people. I see the concomitant impact on the life of my people and area. The Enyimba Economic City project, believed to be capable of sparking an industrial revolution in the South-East is a 9, 803 hectares of land, spanning three local government areas of Ukwa East, Ukwa West and Ugwunagbo. It is located at the centre of the five South-east and four South-south states and it is to be designed to drive massive economic expansion of the region and by extension Nigeria. The agreement for the Economic City is a public-private partnership of NSEZCO, which holds 20 per cent stake, with the Abia State Government and Crown Realities Plc. Abia State Commissioner for Lands, Survey and Urban Planning, Uche Ihediwa, signed the agreement on behalf of the state government; Femi Edun, a director of NSEZCO signed for the Federal Government, while Darl Uzu signed for Crown Realities Limited, the private sector developer. But the special economic zones hold much more promise for the entire country and the rest of the continent. Indeed, the accelerated pre-development work had been carried out by a multi-disciplinary team of consultants including Surbana Jurong of Singapore; CBRE, India; Allott Nigeria Limited; Roughton International, PriceWaterhouseCoopers, and a number of others. And further to the Memorandum of Understanding signed with the Federal Ministry of Industry, Trade and Investment in June 2018, Shandong Ruyi Group of China who met with Mr. President during in China announced an investment commitment of $2bn to the Cotton, Textile and Garment industry in Nigeria by way of anchor investments in manufacturing facilities in Enyimba Economic City, Abia State, Funtua Cotton Cluster and Lekki Free Trade Zone. 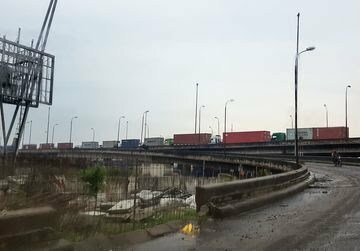 In Lekki, the Lagos State Government has allocated a parcel of 1,000 hectares of land in the North East Quadrant of the Lekki Free Zone to the project company to be owned jointly by its holding company, Lekki Worldwide Investments Limited and NSEZCO. Project MINE (Made in Nigeria for Export) which is to develop the world-class special economic zones (SEZ) is designed to position Nigeria as the pre-eminent manufacturing hub in sub-Saharan Africa, and a major exporter of made in Nigeria goods and services regionally and globally. The project was indeed envisioned by the Federal Ministry of Industry Trade and Investment and the Nigeria Export Processing Zone Authority. According to NSEZCO, it had been noted from recent economic history that when SEZs are developed within a coherent, well designed, executed and funded framework, they help developing countries to utilise their factor endowments and comparative advantage to industrialise, diversify their economies and achieve prosperity for their people within one generation. Such countries, an official of the company explained, have used SEZs to overcome infrastructural disadvantages and constraints; mobilized substantial domestic and foreign direct investment; increased technology penetration; attracted new skills and technologies; integrated into global value chains; created large number of quality jobs; increased export earnings; and achieved structural transformation of their economies. At the signing ceremony, President Buhari said the Federal Government set up NSEZCO as a vehicle for participating in Public-Private Partnerships involving Federal and State governments and local and foreign private investors to develop new special economic zones all over the country, offering world-class infrastructure and facilities at competitive costs. The first set of projects in the pilot phase are Enyimba Economic City, Funtua Cotton Cluster and Lekki Model Industrial Park. Providing the background of the initiative, the President said, “When we decided to continue with the implementation of the Nigeria Industrial Revolution Plan of the previous Administration and launched our Economic Recovery and Growth Plan to fast track implementation, we had a vision of Nigeria as the pre-eminent manufacturing hub in Sub-Saharan Africa and a major exporter to our immediate West African sub-region, the rest of Africa and indeed the World. “Special Economic Zones have an important role to play in achieving this vision. They offer investor friendly incentives, world class infrastructure and ease of doing business in order to attract local and foreign investment and have been used as a catalyst for rapid and inclusive development, job creation, industrialisation and diversified export earnings in several countries. In his introduction, Mr Enelamah had said that the initiative was the choice of President Buhari for the industrialization drive of the government under its three-point agenda on security, economy and the fight against corruption. “We are happy to be here today to progress the project,” he added. On his part, Benedict Oramah, President and Chairman of the Board of Directors of Afreximbank expressed the appreciation of the bank to the Federal Government for the opportunity to be part of the project. He said the objectives of the bank align with that of the project and they are pleased with the ability of the project to grow industrialization. Uche Orji, Managing Director of Nigeria Sovereign Investment Authority also thanked Mr President for the opportunity of the NSIA to participate in the project. “The board saw it as an opportunity to help SEZCOs lift the country through industrialization. It is a good platform for attracting investors and we look forward to its implementation,” he said. Femi Edun, a director of NSEZCO and Dr Bakari Wadinga, Director, Ministry of Finance Incorporated, signed on behalf of the company. Muhammadu Buhari has been re-elected for a second four-year term as president of Nigeria Africa’s most populous nation, which faces a range of problems including corruption, an economic slowdown and security threats. BBC Africa Editor Fergal Keane examines the challenges. The president did make some efforts in his first term to counter the graft which has seen tens of billions drain out of the exchequer. His personal financial integrity has never been questioned. But he has been widely criticised for not going fast or far enough. Will he be more vigorous in his second term? President Buhari has been lucky in his choice of deputy. Vice-President Yemi Osinbajo showed himself to be dynamic and brave when he stood in as acting president, notably reining in the security services and acting to stabilise the naira, the local currency, at a time of deep economic uncertainty. Economically, the country remains dependant on oil prices for 70% of government revenues – a long-term vulnerability that helped pull Nigeria into recession between 2016-17. President Buhari also faces an array of security threats from clashes between farmers and herdsmen in the Middle Belt, continuing instability in the oil-producing Niger Delta and – most worrying of all – a revived threat from Islamist extremists in the north of the country. There, the Boko Haram offshoot – Islamic State West Africa Provice (ISWAP) – used the elections period to stage a series of high-profile attacks including an attempt to fire rockets into the city of Maiduguri on polling day. It may be that he is rejuvenated by victory and his second term is more dynamic than the first. If not the danger is that Nigeria succumbs to the politics of drift with growing frustration among the young who make up more than half the population. This might – at least partially – explain why voter turnout was a record low of just under 35%, down from 44% in 2015. This is the statistic that should worry all political parties in Nigeria. The 76-year-old defeated his main rival, former Vice President Atiku Abubakar, with a margin of nearly four million votes. 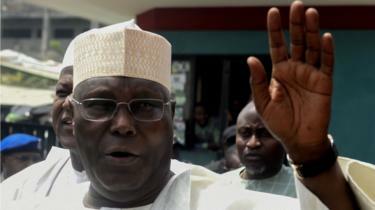 Mr Abubakar’s People’s Democratic Party (PDP) has rejected the result. Turnout was 35.6%. Delays and violence marred the run-up to Saturday’s poll but no independent observer has cited electoral fraud. 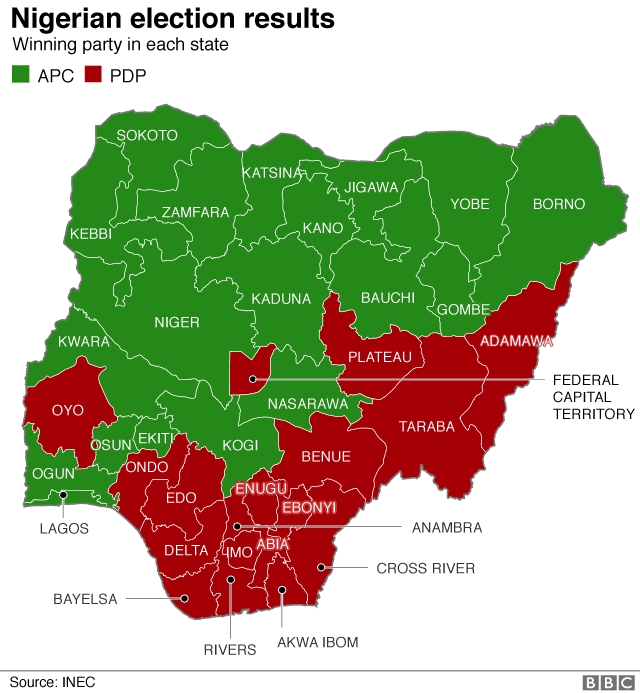 Mr Buhari’s All Progressives Congress (APC) won in 19 of the 36 states while the PDP was victorious in 17 states and in the capital, Abuja, according to the electoral commission (Inec). “The new administration will intensify its efforts in security, restructuring the economy and fighting corruption,” Mr Buhari said after his victory was officially announced. The APC had 15.2 million votes while the PDP had 11.3 million. Some supporters of Mr Buhari took to the streets late on Tuesday in celebration. A former soldier, Mr Buhari led a military regime for 20 months in the 1980s and was first elected president in 2015, becoming the first opposition candidate to defeat an incumbent and win the presidency. His record in office is mixed. 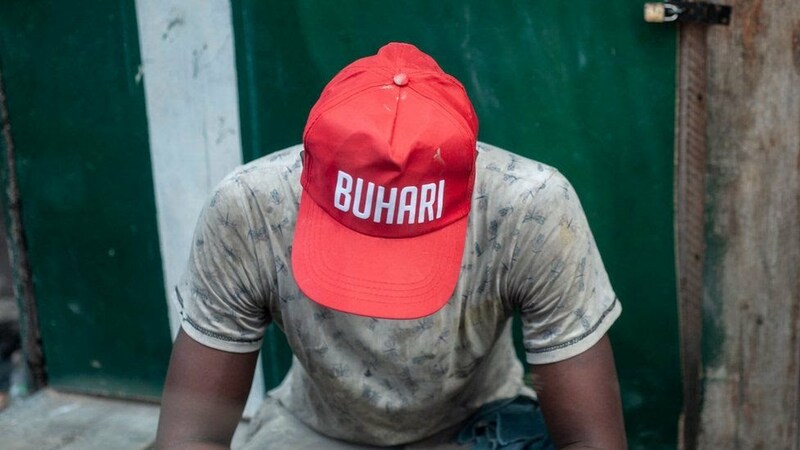 Mr Buhari’s critics say that the very attributes that won over voters four years ago – his strictness and inflexibility – have emerged as liabilities. They accuse him of autocratic leanings as well as a disastrous tendency towards inaction. The breadth and depth of corruption is so great, it affects so many aspects of public life that making serious inroads into the problem would require a focus, energy and application that was lacking in President Buhari’s first term. The second problem he faces in fighting corruption is having the necessary political support. There is undoubted public backing but Mr Buhari’s party is compromised by senior members suspected of enriching themselves through graft. The fear is that across the board the looters will carry on pretty much as normal. 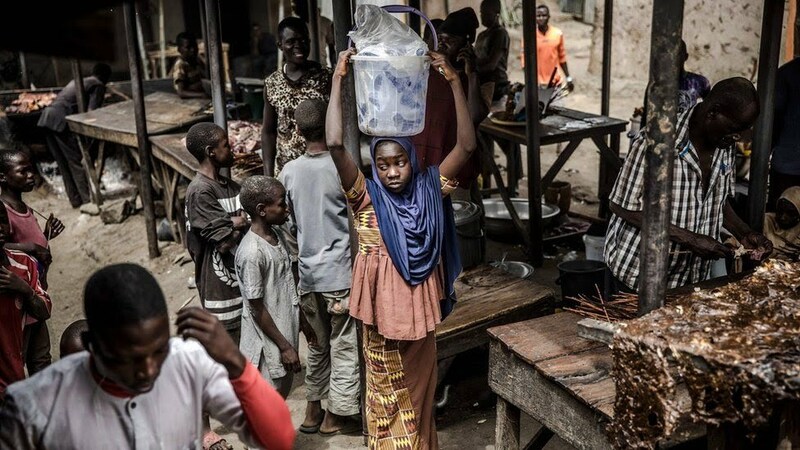 Africa’s most populous nation and largest economy faces a range of problems including power shortages, corruption, security threats, and an economic slowdown. Nigeria is Africa’s leading oil producer but corruption and a failure to invest the proceeds from the industry have hampered development. A slow recovery from a recession in 2016 means there are not enough jobs for the large number of young people joining the employment market. About a quarter of the working age population is unemployed. Earlier on Tuesday, PDP chair Uche Secondus called the count “incorrect and unacceptable”. The party said counting should be stopped, alleging data from voter card readers had been manipulated. The federal government accused the PDP of trying to “scuttle the polls” and prompt a constitutional crisis. Some 130 people have been taken into custody suspected of electoral offences, reports say. The initial vote was postponed early on 16 February, five hours before polls were due to open. Voters were also choosing members of the House of Representatives and Senate. President Muhammadu Buhari is set to be re-elected to lead Africa’s most populous country for an additional four years. 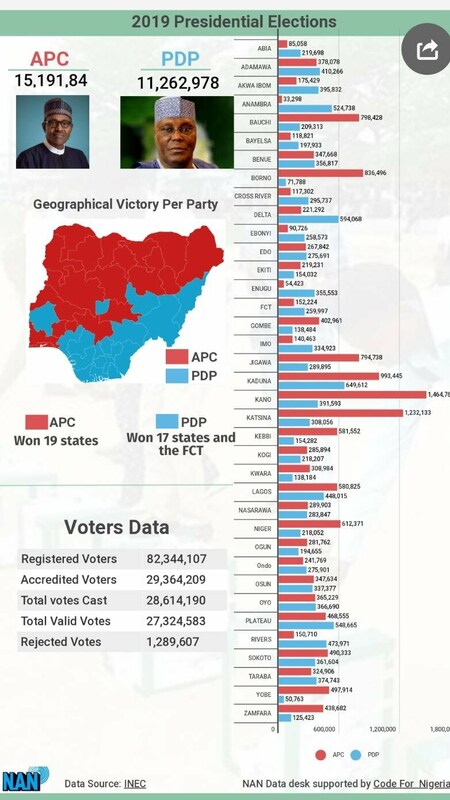 At the end of collation on Tuesday night, February 26, President Buhari crossed the 15 million mark in votes scored in 36 states and the Federal Capital Territory. The News Agency of Nigeria (NAN) reports that Buhari also satisfied the constitutional requirement of making 25% in 34 states and the FCT. Meanwhile, Observer group, YIAGA Africa, had earlier projected that there would be no run-off when the final results of the presidential election is announced. The group made the projection during a press briefing on Monday, February 25 addressed by the chairman of its Watching The Vote Working Group, Dr. Hussaini Abdu. Dr Abdu said its projection is based on what the group received and processed its data from the sampled polling units. His words: “YIAGA Africa’s preliminary estimates indicate that turnout for the February 23 presidential elections will be between 36% and 40% based on official turnout figures collected from the PVT’s representative statistical sample of polling units across the 774 LGAs in the country. “If INEC’s official turnout falls within WTV’s estimated range then it accurately reflects the ballots cast at polling units. “Although YIAGA Africa currently has a stable estimated range for the election outcome, it is the Independent National Electoral Commission (INEC) that has the mandate to announce results. Breaking: INEC officially declares President Buhari winner of 2019 election. Mahmood Yakubu said the duty of the Independent National Electoral Commission (INEC) is to conclude and collate the presidential result for final declaration. He said on the problem of accredited voters not adding up to number of voters, Yajubu said the problem affects less than 2 per cent of voters and thus does not affect the general conclusion. He said in Yobe and Akwa Ibom, the numbers add up. He said on the request of the opening of the commission’s backlend for verification and cross checking of voters, he says it is not a matter of law. He said the discussion can be continued after the end of this process. Osita Chidoka representing the Peoples Democratic Party said there was a discrepancy of more than 1,600, 000 voters in terms of registered voters. He said the cancelled votes affected more than 2 million voters. He claimed there were 5.1 million votes that cannot be accounted for and thus called for a rerun. In his response, Yakubu said the asserting that 5.1 million voters could not vote because of card readers is not true. He also said when card readers are deliberately circumvented, votes will be cancelled. He said constitutionally, he has two roles. Firstly, as a the chief commissioner of the election, he will announce the national collation of results. Secondly, as the returning officer for the presidential election, he will make an official declaration of the winner of the election. The INEC chairman announced that Muhammadu Buhari of the APC scored 15, 191, 847 votes. while Atiku Abubakar of the PDP scored 11, 262, 978. Yakubu said following the collation, he said he now performs his role as returning officer and listed all the names of the presidential candidates and their total votes. He said Muhammadu Buhari is declared winner of the election and returned elected. #NextLevelConfirmed: We’re popping champagne – Buhari’s supporters. 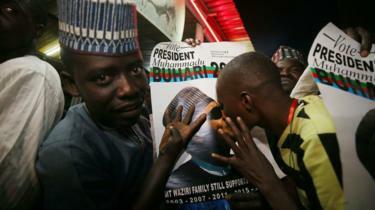 Muhammadu Buhari was re-elected Nigeria’s president, results showed Tuesday, after a delayed poll that angered voters and led to claims of rigging and collusion. Buhari, 76, took an unassailable lead of more than four million votes as the last states were yet to be declared, making it impossible for his nearest rival, Atiku Abubakar, to win. The win was confirmed as Abubakar won in the very last state to declare — Rivers in the south — but could not claw back the deficit. 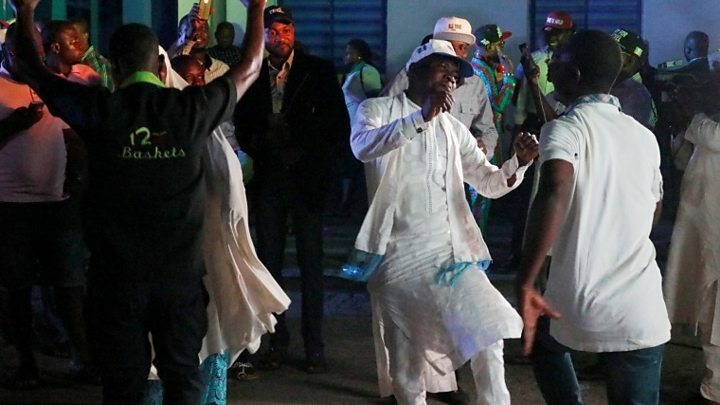 Supporters of Buhari’s All Progressives Congress (APC) gathered at his campaign headquarters in the capital, Abuja, to celebrate even before the final results were announced. 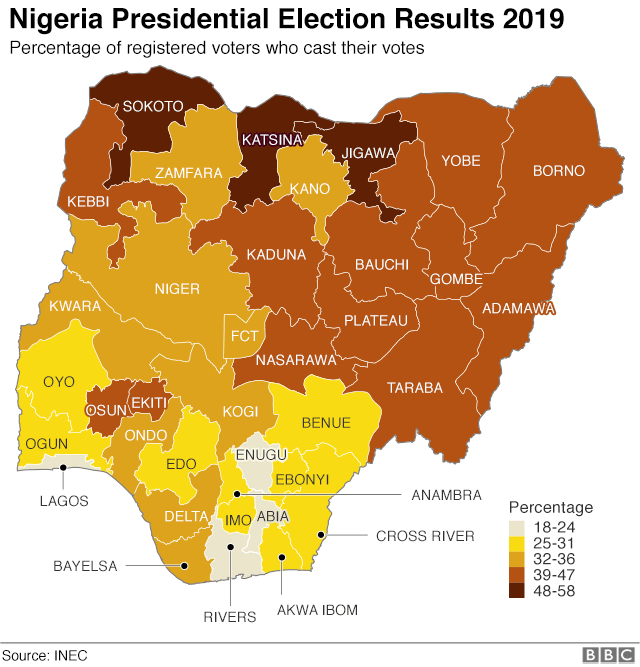 To win the presidency in Nigeria, a candidate needs a majority of votes nationwide and at least 25 percent of support in two-thirds of Nigeria’s 36 states and the FCT (Federal Capital Territory). Initial results showed Buhari won 15,191,847 votes or 56 percent of the vote while Abubakar, of the Peoples Democratic Party (PDP) won 11,262,978 votes or 41 percent. In 2015, president Goodluck Jonathan won plaudits for conceding to Buhari in a phone call, as the results indicated he could not win. “Nobody’s ambition is worth the blood of any Nigerian. The unity, stability and progress of our dear country is more important than anything else,” he said at the time. Previous elections have been marked by political violence, including in 2011, when more than 800 people were killed. There was no immediate official concession from Abubakar, whose party earlier Tuesday called on the electoral commission to halt the count, citing irregularities. The election, which was delayed just before polls were due to open on February 16. The electoral commission cited logistical difficulties in delivering ballot materials. Nigeria’s re-elected president Muhammadu Buhari: in his own words. With none of these fulfilled — and the economy recovering from recession — he portrayed himself as a continuity candidate, hammering home a similar message. He framed the issues as unfinished business, saying in a campaign speech in November his government had “laid the foundation for a strong, stable and prosperous country”. “Foundational work is not often visible, neither is it glamourous,” Buhari added. “We delivered on our commitment to secure the territorial integrity of our nation in the face of a raging insurgency that devastated many parts of the northeast. “We believe we can implement the painstaking and comprehensive policy to bring an end to the conflict between farmers and herders”. “Concrete progress has been made but there is still much to do. We have repatriated hundreds of millions of dollars stowed away in foreign banks. “These funds have been transparently deployed on infrastructural projects and used to directly empower the poorest in society”. “Remarkably the strong economic performance was driven by the non-oil sector which grew 82 percent as of a full year. “These results further underscore our commitment to diversifying the economy away from dependence on oil. “The next level of effort focuses on job creation across various sectors. “The Central Bank has cumulatively lent over 120 billion naira to 720,000 smallholder farmers cultivating 12 commodities across the 36 states and the FCT (Federal Capital Territory). “Targeted crops and livestock have included cattle, poultry, fish, cassava, soybeans, groundnut, ginger, rice, cotton and maize and as a result we have seen a remarkable rise in the production of key agricultural commodities. Nigerian President Muhammadu Buhari has been re-elected for a second four-year term, final results from Saturday’s general election show. The 76-year-old defeated his main rival, former Vice President Atiku Abubakar, with a margin of just under four million votes. Mr Abubakar’s People’s Democratic Party has rejected the result. Delays and violence marred the run-up to the poll but no independent observer has cited electoral fraud. Turnout was just below 35% of registered voters, according to the Nigerian electoral commission (Inec). The commission will make a formal declaration on Wednesday. The announcing of Nigeria’s election result dragged on through its second day as the paperwork came in from around the country. But as Tuesday night wore on, the outcome became more apparent, with President Buhari securing 15 million votes. Initial results indicated high voter turnouts in the north, from where Mr Buhari has received the bulk of his votes. But the national turnout figures look to have been the lowest since the country’s return to democracy 20 years ago. The opposition People’s Democratic Party alleges some figures were incorrect but the ruling All Progressives Congress dismissed these claims. Nigeria’s electoral commission will review any alleged discrepancies before announcing the final results and declaring the winner. A former soldier, Mr Buhari led a military regime in the 1980s, and was first elected president in 2015. He will face a range of problems including power shortages, corruption, security threats, and an economic slowdown. 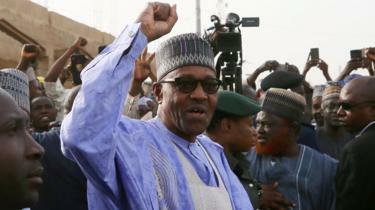 The president has quelled a militant Islamist rebellion in Nigeria’s north-east, but Boko Haram remains active. There has also been an upsurge in violence in the Middle Belt as traditional herders and more settled farmers have clashed. President Buhari on Monday was at his Campaign Headquarters in Abuja where he received updates on the performance of APC in the Presidential Elections. Buhari met with Director of Election Planning and Monitoring Babatunde Fashola, Director Contacts and Mobilization Hadiza Bala Usman, DG Campaign Council Rotimi Amaechi and APC National Chairman Adams Oshiomole at the Campaign Headquarters. President Buhari with Director of Election Planning and Monitoring Babatunde Fashola, Director Contacts and Mobilization Hadiza Bala Usman, DG Campaign Council Rotimi Amaechi and APC National Chairman Adams Oshiomole as he visits Campaign Headquarters in Abuja where he received updates on the performance of APC in the Presidential Elections on 25th Feb 2019. President Buhari with Director of Election Planning and Monitoring Babatunde Fashola.